Cassidy fans have proven time and again how they can make a difference when they work together. This is a time when everyone's help is going to be extremely important. It seems someone has stolen Jack Cassidy's Cassidy family crest ring from Patrick's house. There is a chance we could help the family get it back. UPDATE (9-30-99): There are two crest rings missing, both Jack's and Patrick's - Let's try to find them both! Jack Cassidy researched and found the family crest in the early seventies. He then had six gold pinky rings made bearing the crest. He gave one to each of his sons as well as to his brother with the instruction to never take them off - these are their roots, who they are and they should never forget that. Indeed, Jack was wearing his ring that horrible night in 1976 when he was killed in an apartment fire. According to Shirley's book, this very symbol helped identify him afterwards. To say that tragic night affected these four men would be an vast understatement. For awhile it seemed the rings were a very personal bond that David and Shaun seemed rather reluctant to share as reporters asked about them. All four brothers have faithfully worn their rings over the years and have gradually become more open about them. It is their visible link to each other and their father. The fact that any of these rings are missing is very distressing. The fact that it is their father's is incredibly tragic. We won't ask any questions. We just want the ring. If the person who took the ring knows what he has, he might try to sell it on the internet (or off the internet for that matter) to interested Cassidy fans. We are a very distinct, interconnected market and that might help us locate the ring. Copy the message below and send it out to all of your friends who are Cassidy fans and we will see if we can get a chain letter-like network going so every Cassidy fan is involved. With that many pairs of eyes looking, we might have the chance of working a miracle. It is important to show interest in any dealer who might have the ring and not scare them off - get the contact information to Michele as quickly as possible and she will get the word to Ryan. If you just plain know who has it, please come forward. As was already mentioned, we won't ask questions. The loss of this ring has been really painful for all of the brothers and we would like to return it to them. If you are a fan, ask yourself, what is worth more to you: the ring or the happiness of the brothers and the security of precious memories. Michele will gladly give credit to whoever finds the ring and you will have the gratitude of the entire Cassidy family. So, please. Everyone lend a hand and do your part to help the family. They have done so much for us over the years - It is our turn to return the favor. 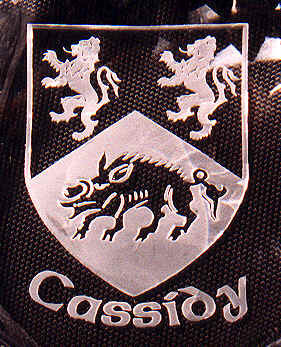 For more on the Cassidy Clan or to see more examples of the crest, visit The Cassidy Clan on the web. 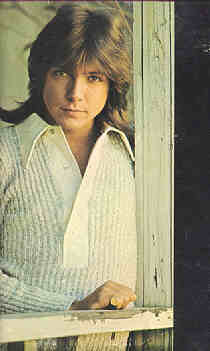 Copy/Send This As An E-Mail Message To Every Friend That Is A Cassidy Fan! Jack Cassidy's crest ring was stolen from Patrick's house and the family NEEDS to recover it. It is a very personal symbol to all the brothers and a tie to their late father. I'm sure everyone knows the story behind the rings (if not, please visit http://members.tripod.com/~ryancassidy/crestrings.html) and that the brothers have all worn their rings over the years. We think the person who has the ring might try to sell it on the internet or elsewhere. THAT'S WHERE YOU COME IN! If you see or hear ANYTHING, please let Michele (FACF@excite.com) know IMMEDIATELY. She will get word to Ryan (and the rest of the family) and maybe we can bring the ring back home. The credit and gratitude of the Cassidy family will be yours! Please note: The policy is going to be that WE WILL NOT ASK QUESTIONS. WE ONLY WANT THE RING RETURNED. So, if you know who has it, please come forward! We need everyone's help! Until then, there is a simple way to help: Copy this message and send it off to every friend you have who is a Cassidy fan or might hear something! Let's form a chain and reach every Cassidy fan! This family has done so much for fans over the years - Let's return the favor! Thanks for your help!